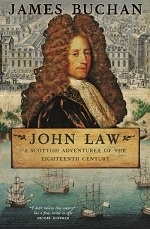 Portrayed over the centuries as a crook, a rake and a gambler, John Law of Lauriston had a financial brain that saw him set up France’s first national bank but also create the country’s own ‘South Sea Bubble’. In creating paper currency he helped rebuild a France brought to its knees financially by the “wars and extravagances” of Louis XIV, the Sun King, and created unheard of public properity before plunging the country into severe economic depression and creating the conditions for revolution. His Compagnie des Indes, better known as the Mississippi Company, controlled all of France’s foreign trade and had the right to mint coins and collect French taxes. As Surintendant des finances et Contrôleur général des finances Law had sole control of both creating money and taxation.